Turner Baker’s Chimney Flue Liners are available in Cheltenham and the surrounding area. Why do I need to line my chimney? So you want to use your chimney as an open fire or install a wood burning stove and you have been told that you need to have the chimney lined. But why? Well, there are various important reasons for lining your chimney. Reason number one – if you are building a new property with a chimney it must be lined to comply with Document J of current Building Regulations. Reason number two – for older properties there are many safety benefits to be gained from having a chimney lined. The most important thing to remember is that the smoke from your open fire or multi-fuel stove or wood burner needs to exit via the flue as quickly and smoothly as possible. Where a chimney is constructed from brick, the bricks may degrade and crumble over time and it is likely that the mortar in between the bricks will degrade as well. Any sign of degradation of the internal brickwork means that the chimney will have to be lined. This is because the flue may leak smoke into another room in the property and also, smoke will travel most efficiently through a smooth flue. Any lumps and bumps caused by the uneven bricks on the way up through the flue will slow down the flow of the smoke; the smoke will cool and leave deposits on the side of the flue. This is not good. A build up will quickly occur and increase the risk of a chimney fire. The internal condition of your chimney may look fine now but if you are planning to install a fire or stove and use it regularly then this will have the effect of speeding up the degradation of the brickwork on the inside of the chimney due to the heating and cooling of the bricks whilst the fire or stove is being used. What do I line my chimney with? There are various flue liners available to suit different budgets and different types of chimney. Remember, the advice of an experienced professional is vital to make sure that you get the right chimney liner for your home. The entry point into chimney and flue linings is stainless steel. There are lots of different grades and ratings of stainless steel, but as a rule of thumb, the thicker the liner the better. Stainless steel can be available in either a flexible format (to accommodate bends in the chimney or flue) or as a rigid piece. Flexible stainless steel liners are supplied as one long piece whereas rigid stainless steel is supplied in sections which are slotted together. Flexible stainless steel flue liners are available from Turner Baker Ltd for either multi-fuel stoves or for gas and oil appliances. 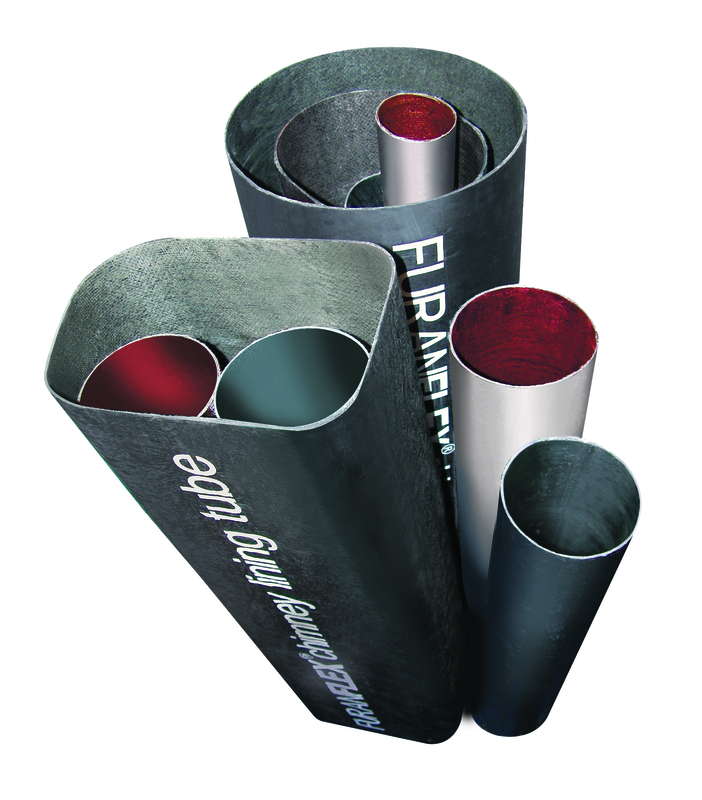 A more durable alternative to stainless steel is the Furanflex system. This flue liner is supplied as a soft malleable material which can be inserted into a chimney and which is then steamed or ‘cured’ into a hardened structure that is resistant to heat and high temperatures. There are many benefits to using a Furanflex lining system. Firstly, the product is installed as a flexible tube. For properties with chimneys that have bends in them – and this is certainly the case for a lot of older properties – this is a great benefit. The liner can be installed freestanding and it can mould to take the existing shape of the chimney which maximises the cross-sectional area of the flue. Various other lining systems are a set shape and may reduce the size of the flue which in turn affects performance. Additionally, the Furanflex liner doesn’t adhere itself to the chimney and can, therefore, be removed if necessary. This makes it an ideal option for heritage properties with listing restrictions which won’t allow for permanent changes to the structure. The Furanflex lining system is guaranteed for 25 years. In the event of a chimney fire – systems such as stainless steel will need to be replaced before a flue can be used again. The Furanflex system can withstand very high temperatures – and in theory should be able to withstand a chimney fire. However, any flue that has suffered from a chimney fire should always be inspected along its length prior to being reused. This system is available in a range of different diameters and lengths which makes it flexible to install – a solution can be found for most types of chimney. Furanflex can only be installed by trained professionals. What flue liner should I use in a new build or extension to my property? The system is lightweight and easy to install. The Isokern system is made from Pumice which is a great natural insulator. Flues made from pumice warm up quickly and take longer to cool down – which means that your fire will work far more efficiently. The Isokern flue liners come in a range of over 18 different sizes – which makes it very flexible to use. Having established that it is very important to line a flue, it is also important to remember that the flue has to be suitable for the purpose that you are intending to use it for. This means that a multi-fuel stove should be fitted to a flue size as specified by the manufacturer. It is no good hoping that a multi-fuel stove that requires a 6” flue liner will work fine if fitted to a 12” diameter chimney. It won’t. The smoke will slow down immediately as it leaves the multi-fuel stove into the large unlined cold flue and you will very quickly find a dangerous build-up of tar and other deposits on the sides of the chimney. The other downside of attaching a stove is to an overlarge flue is that it will affect the draw. The smoke will slow down and cool as the flue is too large to draw the smoke away from the multi-fuel stove efficiently and it won’t work nearly so well. The temperature of the flue has an important role to play in the efficiency of a multi-fuel stove – if it’s too big the smoke will cool straightaway and it won’t draw the smoke away from the fire. Conversely, trying to fit a large multi-fuel stove to a too small flue is also very dangerous – the flue will simply not be big enough to carry away all of the smoke generated by the stove. The reasons for lining a chimney come down to two important points – complying with building regulations and safety. It is always advisable that you consult an expert to assess your requirements before going ahead with the installation of an open fire or multi-fuel stove.